Kendrick Lamar has shared the tracklist and cover art for the Black Panther album he is producing and performing on. Lamar shared the striking cover art on Twitter earlier today, revealing Black Panther: The Album will drop on February 9. Lamar is producing and curating the soundtrack with Top Dawg Entertainment founder Anthony Tiffith. Lamar is also featured on the album alongside artists such as SZA, The Weeknd, Travis Scott, Vince Staples, Jorja Smith, Khalid, and more. The Flash Annual #1 is a real case of good news, bad news for readers. The good news is that it expertly sets the stage for "Flash War," one of Joshua Williamson's most promising Flash storylines to date. The bad news is that readers will have to wait months to see that story resume in the pages of the monthly series. Regardless, there's never been a better time to be reading this series. Even if this weren't the start of a major Flash epic, the fact that this annual puts the spotlight on the original Wally West would be reason enough to give it a look. We've seen too little of Wally 1.0 in this book since he was first pulled out of the Speed Force by Barry. But at long last, Williamson delves headlong into Wally's dilemma as a refugee of the pre-Flashpoint DCU. Apart from Barry and the Titans, no one remembers this Wally or the relationships they once shared. Within a handful of pages, Williamson had me wondering why DC hasn't bothered to give Wally his own book yet. There's clearly more than enough meat there. 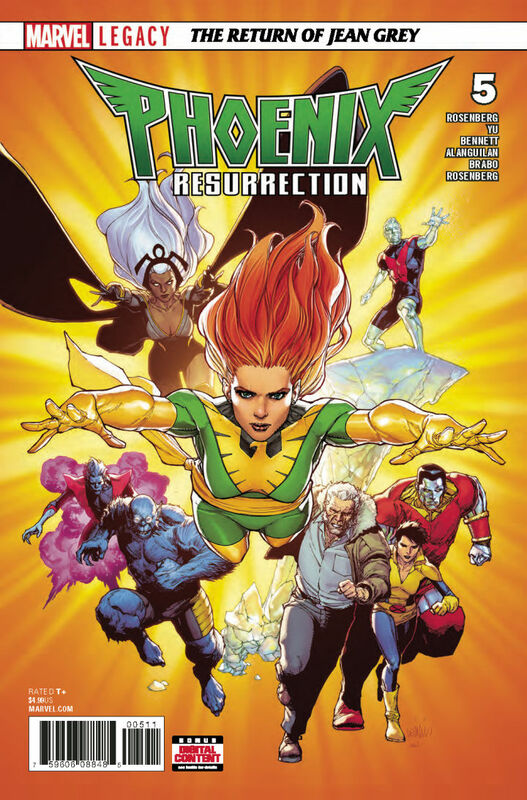 Phoenix Resurrection: The Return of Jean Grey ended by living up to its name, as Jean Grey is indeed alive and well. Previous issues focused on Jean as she was trapped inside a Phoenix-generated dome in the New Mexico desert, leading a false life alongside fictional recreations of her closest friends and family. But Old Man Logan managed to snap her back into reality by slashing the throat of Annie, Jean's childhood friend whose fatal car accident first caused Jean to manifest her powers. Warning: this review contains spoilers for Star Wars: The Last Jedi! The biggest drawback with the current crop of Star Wars novels and comics, compared to the Expanded Universe days, is that these stories have far less freedom in which to operate. The days where where you could resurrect Emperor Palpatine in a comic or kill off Chewbacca in a novel are well behind us. That's the trade-off to having a new, Disney-sanctioned universe where every new story has its carefully chosen place in the larger scheme of things. Nowhere has this problem been felt more than with Marvel's meager offering of comics set in the post-Return of the Jedi era. It too often feels like creators are being constrained by Lucasfilm and prevented from venturing away from a very narrow path. Star Wars: The Last Jedi - DJ - Most Wanted #1 is no exception, sadly. The darkest hour before the end. Black Panther has continued to break pre-sale ticket records, becoming both Fandango and Alamo Drafthouse's fastest pre-selling superhero movie. Black Panther now outpaces all superhero movies in presales, surpassing 2016's Batman v Superman: Dawn of Justice. Black Panther set a Fandango record earlier this month for also being the top pre-selling MCU film in the first 24 hours. According to a Fandango survey of over 1,000 fans intending to see Black Panther, 97% want to see a different kind of superhero film, 95% are excited about the movie's positive messages, and 93% can't wait to see Chadwick Boseman in action as the titular superhero after his performance in Captain America: Civil War.